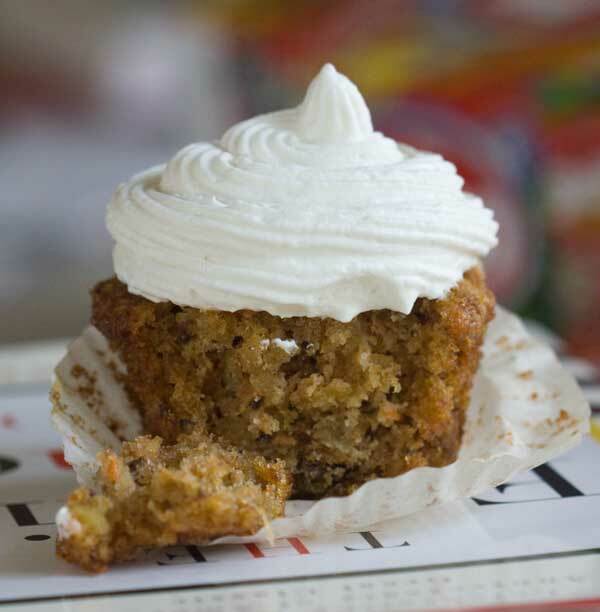 Rabbit’s Carrot Cake Cupcakes are adapted from Rabbit’s Carrot Cake in The Fanny Farmer Cookbook. I made them as part of my quest to find the perfect carrot cupcakes, and I’m pleased with the results. They are brown rather than orange, and crumbly and moist rather than mushy-moist. The flavor and texture remind me of the carrot cupcakes I buy at a cupcake shop called Sugar Mama’s, though they are not quite as dark. Interestingly, one thing I’ve found through all my carrot cake making experiments is that I get a crumblier texture when I use baking powder and baking soda as opposed to the 2 teaspoons of baking soda you see in a lot of carrot cake recipes. According to Cook’s Illustrated, baking soda makes the batter more alkaline which causes the cell walls of the carrot pieces to break down and leak moisture into the batter. The comparison they make is to a plastic bag filled with water that gets punctured. Maybe the baking powder keeps the batter more acidic and lessens the breakdown of carrots into carrot juice? Science aside, Rabbit’s Carrot Cake Cupcakes are very good. Carrot cupcake recipe adapted from Fanny Farmer's "Rabbit's Carrot Cake"
Preheat the oven to 350 degrees F. Line 22 to 24 cupcake cups or grease and flour two 8 1/2 by 4 1/2 inch loaf pans. In a small bowl, mix carrots, lemon juice, and pineapple. Set aside. In the bowl of your food processor (or just use a bowl), combine flour, both sugars, baking powder, baking soda, salt and cinnamon. Pulse to mix, then add butter, oil, and eggs, one by one until mixed. Add carrot mixture and pulse until mixed, then add the raisins and walnuts and pulse lightly just to mix or just stir with a rubber spatula. Divide evenly among the cupcake cups, filling a little over 3/4 cup full, or divide among two loaf pans. Bake cupcakes for about 25 minutes or loaves for about 45 minutes. If you don't want to use brown sugar, you may use 1/4 cup granulated sugar in place of the 3 tablespoons of packed dark brown. If using light brown sugar, use 4 tablespoons instead of 3. The low fat recipe I made had NO oil and only egg whites. Instead of the skim milk called for in the recipe, I used low fat buttermilk, so that is the only fat. I so agree that carrot cake needs nuts and pineapple, coconut and raisins are good, too. I thought the same thing. I remembered seeing that somewhere else… perhaps my copy of The Pastry Queen? I’ll check when I get home! Stephanie, thanks for the link! I’d be curious to see how a tablespoon of baking powder works in carrot cake. Also, I love Cinnamon Raisin Swirl bread! I haven’t made it in quite a while, but I’ll see if I can find a good recipe. Have you seen this one? Pineapple pudding! It is from Cook’s Country. http://traceysculinaryadventures.blogspot.com/2013/03/tropical-carrot-cake-with-cream-cheese.html#.UVyLVZ3D91s. (P.S. Do you take requests? How about Cinnamon Raisin Swirl bread?) Sorry… I love your posts!!! Nancy, it’s just whipped cream. Normally I use cream cheese frosting, but I didn’t feel like making any so I used some whipped cream that I’d whipped the day before. Katrina, I like low fat and almost fat free carrot cakes too. I’ll have to do a different rundown at some point in time comparing reduced oil recipes. Leah, I agree. Walnuts (or pecans) are essential. I think pineapple is too. This recipe sounds perfect, although I love to add a little bit of ginger as well as cinnamon, it just adds another layer and really compliments the deep flavour of the carrot cake. Pleased to see you have walnuts in there, I can’t stand a carrot cake without!! I JUST made carrot cupcakes yesterday. They were almost fat free, but still hit the spot and were pretty good. Haven’t seen this before, but the carrots are cooked and then made into a puree. It would be interesting to try this method but not have such a low fat/low sugar cupcake. I like nuts and such in them, too, and these didn’t have any. I’ll be blogging it next week for SRC. Yes! Dark is what I love in carrot cake! I’ve made carrot bread and muffins with molasses and wonder if that is the ‘secret ingredient’ in some of my favorite dark carrot cakes. Although lighter, the texture on that muffin looks perfect.